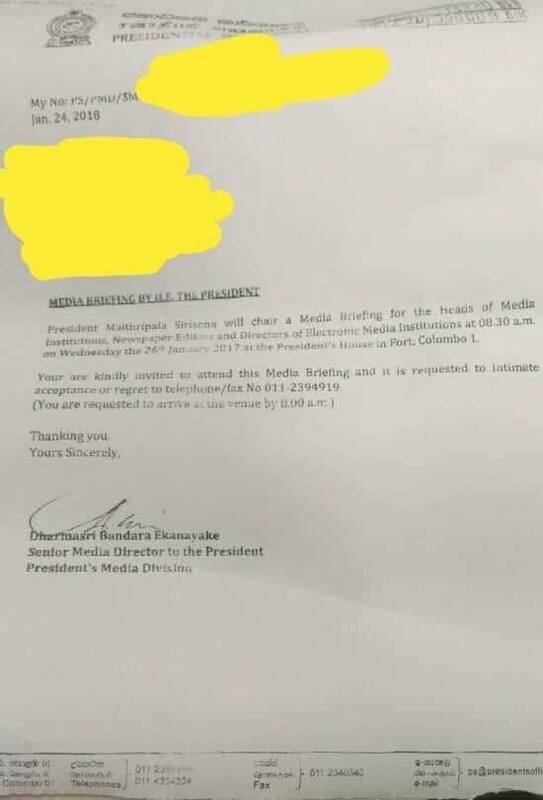 A letter has been sent to media heads inviting them for a briefing by the President on a date that’s long passed. The letter has been dated ‘Jan. 24, 2018.’ Clearly whoever drafted the letter has used an old template and not done the necessary changes. The Presidential Media Division has three directors in addition to Ekanayake, namely Chaminda Sirimalwatte, Chamuditha Samarawickrama and Sugeeswara Senadheera. This is no mean minor error, it’s a terrible error, and making the President laughing stock of the people. Bloody idiots and donkeys with big titles. President should fire all of them if they are unable to write properly an elementary and simple letter. Remember, the average IQ is 79, and that allows for many “Bloody idiots and donkeys”. Certainly, the President should be able to identify and separate them. Over the top comment and OTT CT article. Yes, the sender ought to have reviewed the mail and corrected before releasing it. But readers, this is a very common error that occurs soon after the arrival of a new year. People so used to dating year-17 for 365 days previously, the mind, brain, and hand need time to adjust. Even when re-read, the mind sees what it wants to believe and not what the eyes see. In fact I made this same mistake only two or three days ago; having sent out the errant mail, I realized the mistake, embarrassed by my mistake, and sent out a revised date immediately with an apology. It is a very common Human Error that occur regardless of the rank, which we learn to overcome as days pass by, . A regrettable oversight unworthy of carping over. An example of nitpicking at its best. Your ‘explanation’ is out of place here! Please note in the body of the letter it is stated ‘Wednesday the 26th January 2017’. While dating the year as 2017 is acceptable as an inadvertant error for 2018, the date code ‘Wednesday the 26th January 2017’ cannot be, by any stretch of argument, acceptable as ‘the mind sees what it wants to believe’! This is sheer incompetence and lack of professionalism! What else can you expect from YAMAPALANAYA. Gura hitagena golayo duwa duwa. Is it a case of paying peanuts and getting monkeys. Since this was signed by Senior Media Director to the President, this must be a case of paying too much and hiring a Lanky who must have come through back door. I meant no offence to monkeys, one can train them to do mundane jobs perfectly and efficiently. It only reflects the incompetence of the President. It is obvious that his House Management is below par.The choice of personnel, how they are managed, and the maintenance of best practice at the top aRe essential for the country. Here we have an incompetent gamarala who does not know whether he is coming or going. We could only imagine what would happen if Ranil is in charge. He will appoint Ravi who will steal all the stationery! Ravi K, as finance minister sent an undated letter during the Bond scam; the whole world knows why? Now President Sirisena M, has fallen to the same level of negligence that shows he is no longer in control of the country. This is not only sad but dangerous. Ravi started with lies and President Sirisena has been also lying at public rallies since he started the local election campaign. The most recent is his erroneous statement about MR. He said MR called Ravi and congratulated him after a certain ‘no-confidence motion on Bond scam against Ravi K at parliament. We all know that there was no such no-confidence motion tabled at Parliament since Ravi was forced to resign. Will he correct this mistake or will he choose the path of RaviK (who kept denying that he lied)! Finger trouble with a date? Big deal! Ex Finance Ministers brain and memory trouble with 13,000, 000,000 SLKR, and Prime Ministers dismisssal of the crime with a “Oh, I just believed mahendarn’s word”. Who should be kicked out of the office.- the big robber dpoing parrot dances or the typist? There was no loss to the GOSL already 12billion bucks in the account. If i can deposit one hunderd thousand and recover 120,000 in 6 months i would put all my savings there.